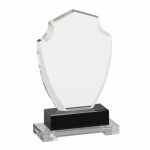 These Crystal Shield awards are ideal to recognize the ultimate in achievement. Boasting a classic shield design and a beautiful black crystal base sitting on top of a larger crystal base complete the look. The Crystal Shields come in your choice of three different sizes, 7 3/4" X 5" X 2 1/4", 8 3/4" X 5 1/2" X 2 1/4" and 9 3/4" X 6" X 2 1/" and provide plenty of space for whatever your personalization needs might be. All crystal awards can be laser engraved or sandblasted. A handsome lined presentation box is also included with these items. Imagine the expression of the person when they see their name on one of these impressive awards. Crystal Shield 7 3/4" X 5" X 2 1/4"
Crystal Shield 8 3/4" X 5 1/2" X 2 1/4"
Crystal Shield 9 3/4" X 6" X 2 1/4"
A 4"x 3/4" thick blue crystal star sits on a 4" clear crystal pedestal on this stunning star award. The pedestal has ample room to personalize for recognition of the rising stars in your organization.